This small painting of Pasadena’s famed Colorado Street Bridge (AKA suicide bridge) features a time between summer and fall when the leaves were starting to turn. 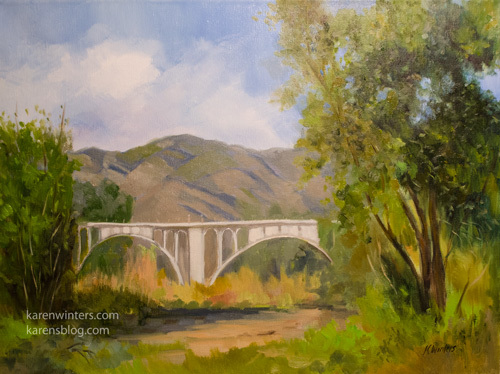 The Colorado Street bridge in the Arroyo Seco is one of my favorite painting subjects, and I continue to find new ways to see it and to interpret it. 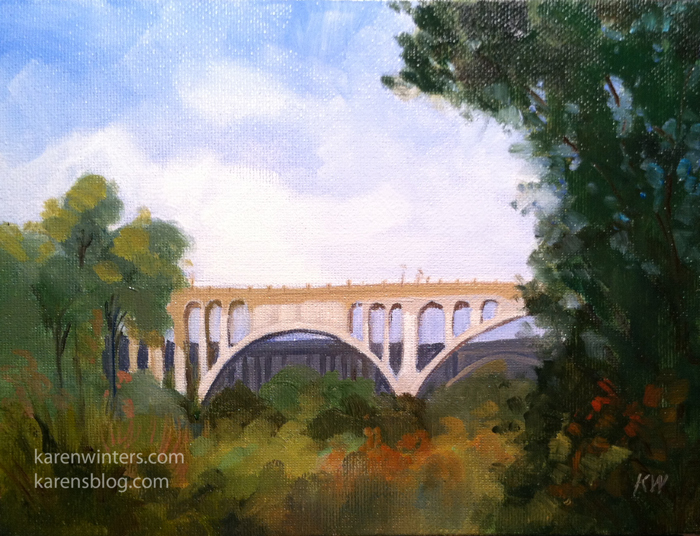 This impressionist treatment conbines two points of view that are somewhat difficult to see simultaneously, but I think it’s faithful to the subject of both the bridge and the San Gabriel Mountains. The time of year is springtime, not so very far away with our recent rains. Mouse over the picture to reveal the Pinterest button. 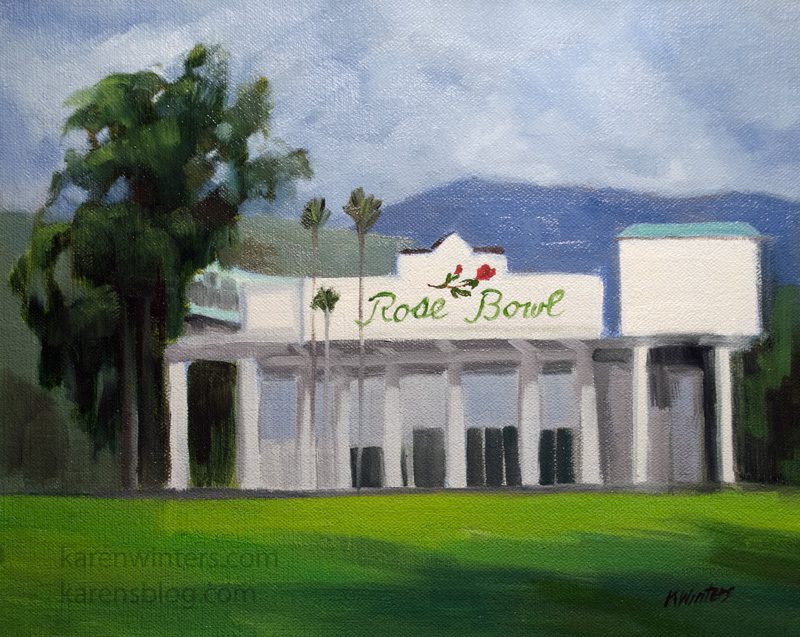 It’s getting to be Rose Bowl time again … so I thought I’d do another painting of our hometown landmark. I haven’t been to many games there lately, but I do enjoy walking the 3 mile perimeter, especially on a beautiful day. Yes, I know there’s a restroom building and some other building clutter out there, but I reserve the artist’s license to leave those bits out, ok? The jumbo screen is blank but if you purchase the painting and would like your team mentioned there, let me know – anything’s possible! Mouse over the painting to see the Pin it button if you’d like to pin it on Pinterest. This new painting is intended as a Christmas gift from the lovely woman who commissioned it, for a very special gentleman. The rose garden was where they first met. Built in 1906, the Tournament House was purchased by chewing gum magnate Wm. Wrigley in 1914. The home was given to the city of Pasadena in 1958 for use by the Tournament Association. The centennial rose garden (seen here) is spectacular in full bloom. The painting represents it in early morning light. Don’t you just love romantic stories? I know I do, and I get a special joy from making paintings that commemorate special events – like first dates, first meetings, places where proposals happened, and so forth. If you’re considering giving a painting as a holiday gift, this is a very good time to get in touch as things get busier as the season draws closer. Interested in commissioning a painting? 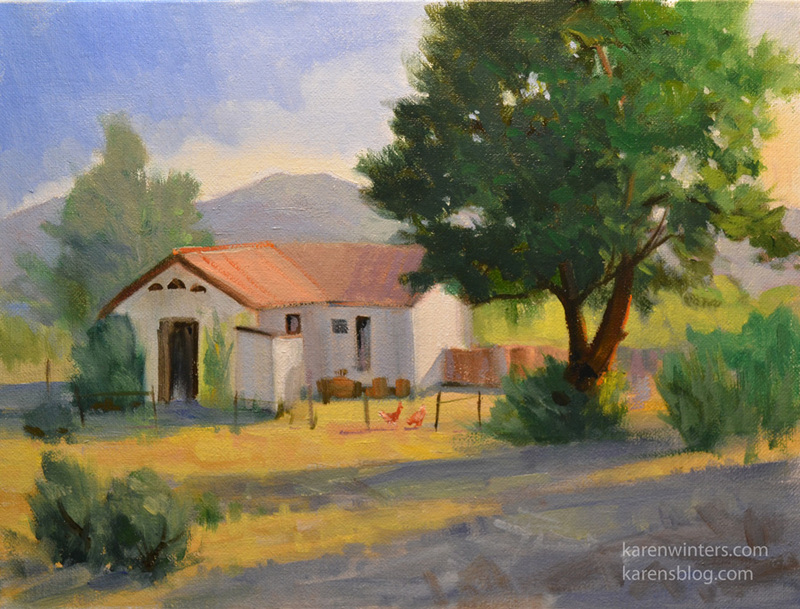 During the California Art Club paint out at the mission, I came upon this small guest house which intrigued me as a painting subject. In the late afternoon light, I could imagine it as an old California adobe, cool inside in spite of the surrounding heat. Some early model chickens miraculously appeared where a late model car had been. While I was in San Luis Obispo County for the Plein Air Festival this year, I saw this charming rural scene down a side road in Los Osos. 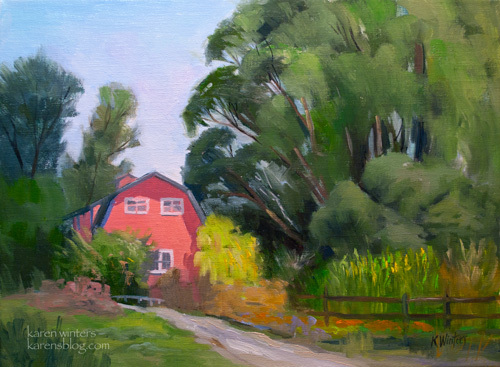 The red barn style house provided a beautiful contrast to the vibrant green eucalyptus trees, and I liked the small vegetable garden growing nearby. It took me back to early California days, a bit of the past still thriving in the present. 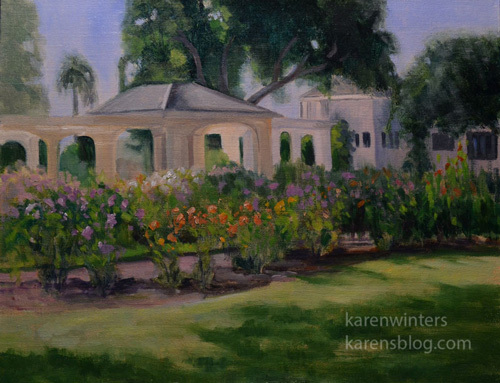 For a long time, I’ve wanted to paint a charming bridal shop in Pasadena named Mary Linns. I’m guessing that it has been there a very long time and no doubt contributed to the joy of thousands and thousands of brides. This young couple was window shopping. I can only imagine what was going through both their minds. I think this has a nice narrative quality to it. It happense to be Pasadena, but it could really be anywhere that young lovers plan their future. Click this link to write me. 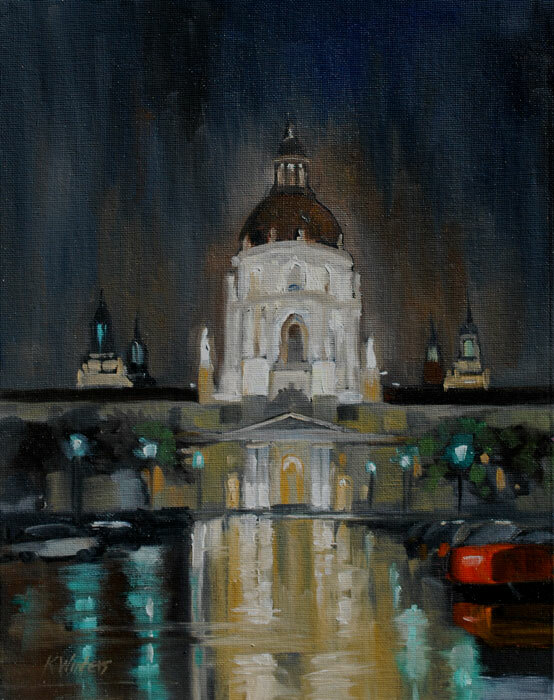 This painting will be included in the next California Art Club show at the Old Mill in San Marino as part of the ten-year anniversary celebration: Urban California II. The address for the Old Mill is 1120 Old Mill Road, San Marino, CA. The show will run from September 7, 2011 through January 8, 2012, with an artists reception on Thursday, September 15, from 5:30 – 7:30 pm. I loved the colors as they shimmered in the wet pavement. The scene reminded me of those architectural renderings of buildings, where the sidewalks and streets are always shiny and fresh as though it has just rained. 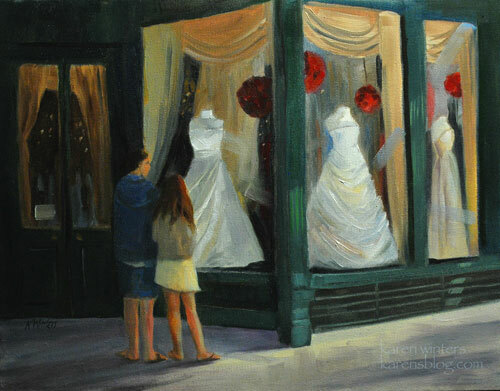 See more of my wedding paintings here. I had the honor of painting this live event at Descanso Gardens for some dear friends who are also collectors of my work. The occasion was the marriage of their daughter to a fine young man. The party was going to be in the evening which presented certain strategic challenges – namely, painting at the time of day that the light was changing the most rapidly. The bride and groom couldn’t be dancing in the dark under the pavilion while the sun was still shining brightly. Nor would it make sense to paint the whole thing in the dark, because then the beautiful garden couldn’t be seen. 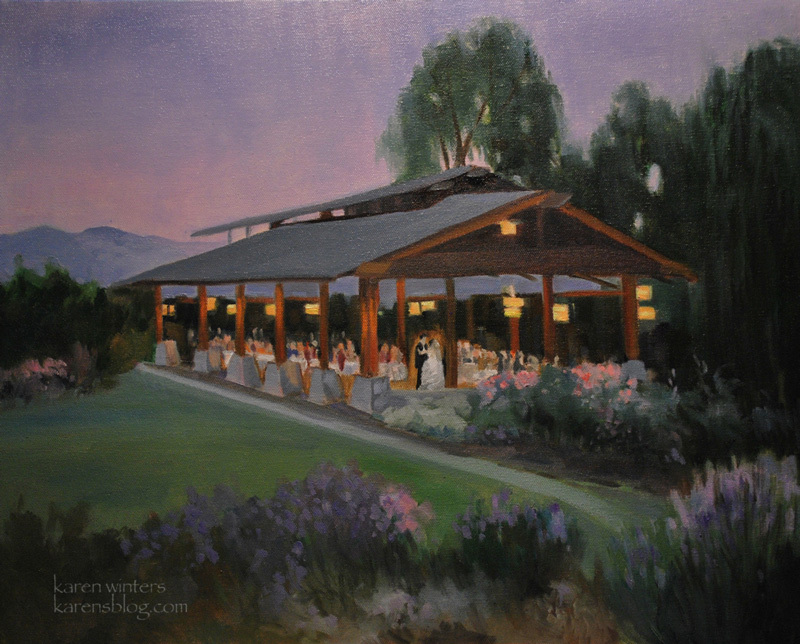 We decided on a twilight look, and I painted the garden as rapidly as I could right after the ceremony, knowing that I could always paint the sky in later. It was a lovely occasion, and one that I hope they will always remember with romantic notions, whenever they look upon the painting of that day. 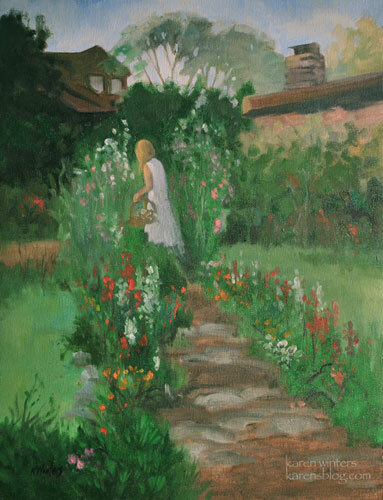 I’ve been thinking about painting this subject for several years, since my husband and I were out on a walk in Pasadena and we came upon a scene of a woman cutting sweet peas along the cottage garden path leading to her front door. The location is near S. El Molino Street, or S. Oak Knoll, near Cornell, but I neglected to write down the exact address. I told her I was a painter and asked her permission to take a picture and she pleasantly agreed. I changed the color of her dress from periwinkle blue to white because it contrasted better with the green of the sweet pea vines. The picture was taken in March when everything was verdant green, and the flowers – snapdragons, pansies, poppies and more – were at peak bloom. I should try to walk the area again some time and see if I recognize the houses and the path. Although I prefer to do plein air studies as preparation for studio paintings, there are some occasions when a composition just presents itself to you and there you are without an easel, and the light fading fast. This was one of those occasions when I was glad I had a camera with me.